Whatever You Do – Don’t Laugh! Being a Total Rock Star Isn’t Easy! In order to express myself, I must first accept myself. One of my biggest fears about expressing myself and sharing my creativity and talents has always been the fear of being laughed at or dismissed. I have so many defense mechanisms in place to avoid being laughed at and ridiculed. I don’t want to place blame. That doesn’t change things now. Heck, I don’t even want to explore the reasons why I am the way I am. It won’t really matter. I already know. I am the way I am. I accept myself the way I am. I have fears and I handle them. I am at a point in my life that I have accepted myself and now I am ready to express myself. I began doing that when I began blogging. Sharing my thoughts, my feelings, and my experiences with the “world” – with you – has been the key that unlocked my true self and set me free! That freedom has fueled the flame that keeps my desire for love, joy and happiness burning in my heart. This week I had the opportunity to share one of my poems at a performance of spoken word alongside some very talented musicians, poets, and artists. 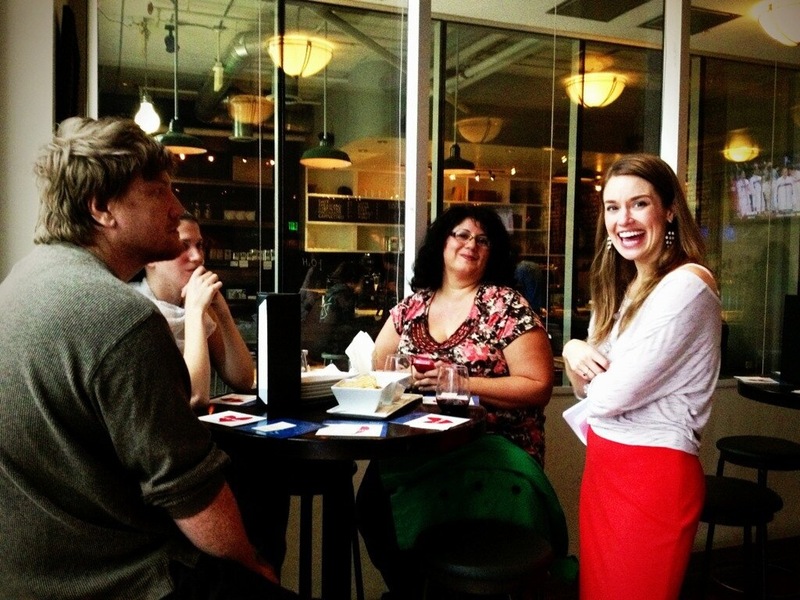 When I was asked if I wanted to read a poem I said, “Yes!” without hesitation. When I was asked if I was nervous, I said, “Yes!” but it was the excitement kind of nerves, not the sick or stage fright kind. The fears that came to mind were brief fleeting moments of panic. What if I mess up? What if they laugh at me? What if no one likes my poem. What if I get sick to my stomach? What if I have an anxiety attack? What if I get a migraine or vertigo and can’t go on? These things have happened before. The thoughts of my biggest fears did not remain in my consciousness for very long. I have always wanted to get to a point in my life where the things I enjoy doing are not a challenge. They are just a part of me. I want to show the world that I can do these things well. I have always wanted to be able to share my talents without concern for what others think, without fear of judgement. This was significant in my life’s journey because I have now become more confident in myself and my abilities than ever before. It was because of that confidence that I did not get nervous or sick. And you know what? I rocked it! It was great! Not just because I did not get ill. Not just because my friends said I was good. Not just because I didn’t mess it up. I enjoyed the experience. I shared my talent with my friends and family. And – no one laughed! I did great because I believed in myself. 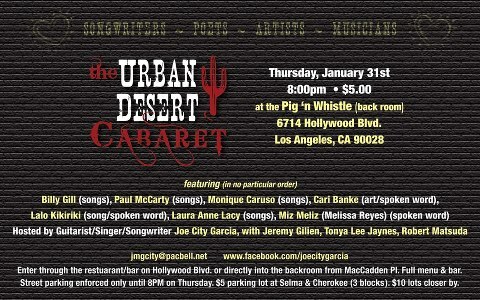 Thursday night’s performance of The Urban Desert Cabaret was a show that my cousin, Joe City Garcia arranged. The show takes place about once a month and if you like folk music, art, and poetry – you should definitely see it. Most of the performers have a few things in common, they either know Joe City and/or have some connection to Joshua Tree – a community of artists who live or work in the desert. These men and women all have a soulful camaraderie and connection to the earth, to light and to love. Even if you just appreciate great music and song – this show is for you! 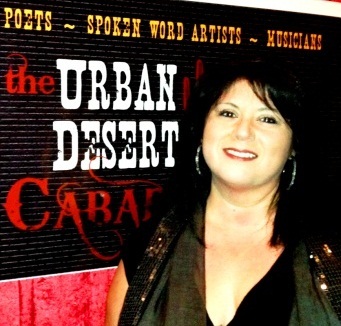 You can read more about UDC in my previous posts: Hollywood Nights and Urban Desert Cabaret. It was exciting to be named in the event flyer! I don’t want to forget anyone, so here is the line up from the January 31st show: Guest artists: Billy Gill (songs), Paul McCarty (songs) Monique Caruso (songs), Cari Banke (art/spoken word), Lalo Kikiriki (song/spoken word), Laura Anne Lacy (songs), Miz Meliz (Melissa Reyes) (spoken word) and more TBA! Plus songs and jams with the UDC combo: Jeremy Gilien, Tonya Lee Jaynes, Robert Matsuda & host Joe City Garcia. First, Joe City and the Urban Desert Cabaret combo band started off the show with a few songs. Their music is transfixing. It brings me to a place of soulful reflection. Have you ever driven through the desert and listened to the album by U2, Joshua Tree? It opens up your horizons. That is how Joe’s music is to me! He is a rock star that I have admired my whole life. Joe thanked everyone for coming and explained a bit about UDC. Then, he said something like “who wants to go first?” and at that moment, I had just stood up. He looked at me and said, “Miz Meliz – are you ready?” I had told myself ahead of time that whenever he asked me I would say, “I am ready!” and I did. And I was! I didn’t expect to go first, but I was happy to because then I could relax and enjoy the rest of the show. It was a bit of a bummer because some of my friends missed it, but it was good for me. Next up was a great performer who played accordion and sang, her name is Lalo. 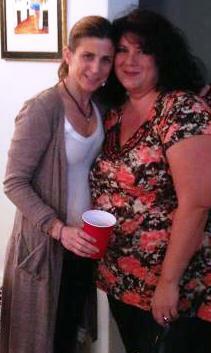 . . her songs were light and fun and she told her stories in a way that made me smile. She was a bit of a crack up and brought some humor to the scene. After Lalo, Billy Gill came up and performed a few songs. His guitar playing is remarkable and his singing is impressive! I enjoyed the guitarist Monique Caruso and was impressed that one of the pieces she performed had just been written the night before! (I wrote the poem that I read over a decade before!! Some people cant help but share their talent, it precedes them.) Then we had the pleasure of a performance by the Wicked Saints with Paul McCarty and Retro Rob Thomas. They were awesome! Cari Banke spoke about her art that donned the walls all evening and shared some introspective poetry that she wrote to accompany her pieces. When she took the stage, she said, “Are you all in a good mood? Having a good time? Well, I am about to bring you down.” Her art and poetry was about genocide and survival. She was very insightful and did manage to leave everyone on an upbeat note! There was more singing and guitar playing, more poems were shared and the UDC combo wrapped up the evening with more tunes. It’s surprising that all of this is put together and performed without rehearsals or much else in the way of planning. It always comes off flawlessly, because of the spirit and expertise of Joe City – all the performers make a commitment to be there and they bring their best to share for that moment. It was an honor to be a part of it! My performance is on my You Tube Channel and the poem is posted here: That Funky Tree. Saturday I had the chance to spend some time with some very creative friends that shared their unique talents with others too! I have recently shared some of my humor with Fazel Huts and I always say that laughter is the best medicine but a true comedienne is a hot commodity! It is not easy to be a woman and be funny. 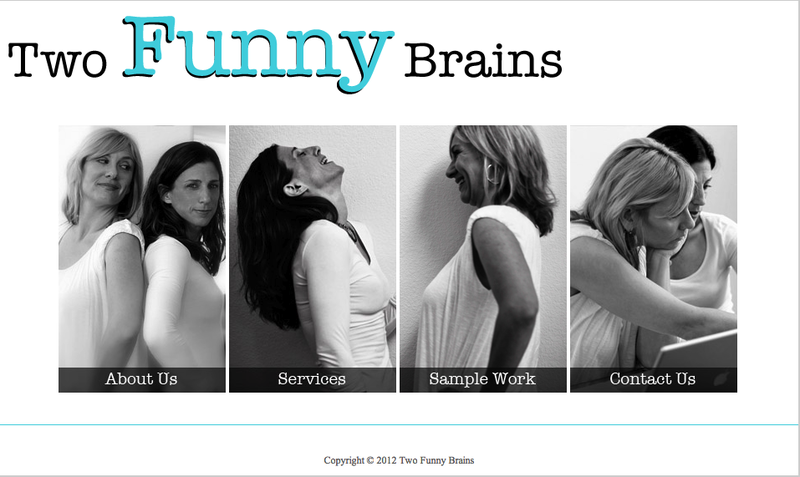 That’s why I love the Two Funny Brains! To me being “a total rock star” is being able to show off your talents in a big way. I admire everyone who does that and makes it look so easy. I know it is not easy. Creativity and rocking a special talent comes naturally to some people and it is a difficult journey for most. No matter what, keep at it! Don’t ever give up hope! Face your fears. Find ways of making it work. It’s your time to shine! Behind the scenes busy at work at all the above events are the bloggers that I know that help to promote and in doing so are encouraging and supporting one another constantly. Please check out their blogs, Like them on Facebook, and Follow them on Twitter and Instagram. Carolyn, Jamie, AJ, and Deanna. I had a blast sharing these experiences with them and I am glad to have their friendship! than you ever were before. you have let go of along the way. just make you all the more wonderful.